An unsung researcher and theorist in hominology and cryptozoology, silently passed away last year. The news was only just sent to me recently, by a friend. Gordon R. Strasenburgh Jr., 77, of North Bend, Oregon, died on August 7, 2018. I have written about Strasenburgh for decades, as I was a strong advocate of the “Strasenburgh school.” In the 1970s, along with the late Mark Hall, we promoted Strasenburgh’s theory in our articles and books. Strasenburgh saw the fossil candidate that was the best fit for the Patterson-Gimlin Bigfoot was not Gigantopithecus, but Paranthropus. During the last half of the 20th century, the number one fossil candidate that arose in discussions about Yetis and Bigfoot was Gigantopithecus blacki. That theory was promoted by anthropologists Grover Krantz and Jeff Meldrum. The other favored fossil affinity for Bigfoot was proposed in 1971 by Gordon Strasenburgh, who wrote in scientific journals, a self-published booklet, and through correspondence with other hominologists and cryptozoologists of his speculations. Loren Coleman and Mark A. Hall were two names of Bigfoot students who never missed a chance to credit Strasenburgh’s theory. 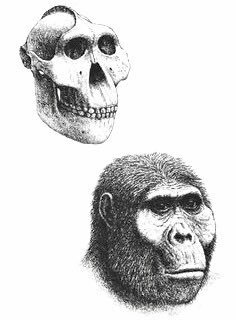 Strasenburgh thought Bigfoot would be found to be related to Paranthropus robustus. He wrote that the future discovered Bigfoot would be found to not be aligned to Gigantopithecus, but suggested, instead, a new species he named Paranthropus eldurrelli. As we moved into the 21st century, the Gigantopithecus theory began to lose some supporters. 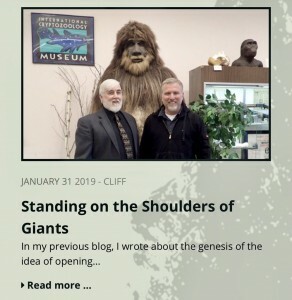 Krantz died, Meldrum openly began lecturing on the positive points about the Paranthropus theory, and people like Cliff Barackman joined the Paranthropus school. Soon after the Patterson-Gimlin footage was captured of a Bigfoot at Bluff Creek, California, on October 20, 1967, Strasenburgh began considering what was being seen. Strasenburgh first published the body of his thoughts in a self-published 11-page booklet entitled, Paranthropus: Once and Future Brother (Arlington, VA: Gordon R. Strasenburgh Jr., 1971). Strasenburgh kept in the background of hominological research, while getting some of his research published. 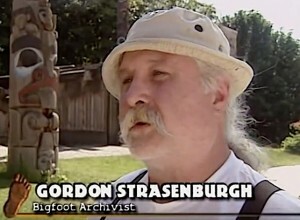 In John Green’s The Sasquatch File (1973) and Sasquatch: The Apes Among Us (1978), Gordon Strasenburgh is mentioned as living in Atlanta, Georgia, doing file searching at the Library of Congress in Washington D.C., and doing field research in North Carolina and Florida. Strasenburgh either moved around a lot with his family or traveled far afield to track down leads during the 1970s. In Northwest Anthropological Research Notes, 9 (2): 281-298, edited by Roderick Sprague, (1975), Gordon Strasenburgh wrote “Perceptions and Images of the Wild Man.” This paper was re-published in 1977 and 1979, in The Scientist Looks at the Sasquatch and The Scientist Looks at the Sasquatch II, edited by Roderick Sprague and Grover S. Krantz (University Press of Idaho). 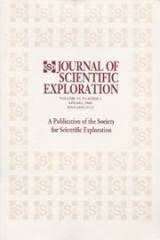 In 1979, in Current Anthropology, 20 (3): 624-627, Strasenburgh’s “More on Neanderthal vs. Paranthropus” was published. 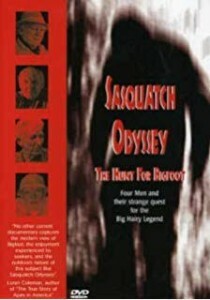 In the bright yellow book entitled The Sasquatch and Other Unknown Hominoids (1984), Strasenburgh’s paper on the Patterson-Gimlin film was published along with other radical selections that were in answer to the conservative approach of Marjorie M. Halpin’s and Michael M. Ames’ Manlike Monsters on Trial: Early Records and Modern Evidence (University of British Columbia: Vancouver, 1980). Before the days of conferences and cryptozoology reality television programming of the 1980s, Gordon Strasenburgh was the “invisible man,” and remained out of the limelight of Bigfoot studies. He did, however, show up in a couple of significant documentaries. In Peter von Puttkamer’s 1999 documentary, Sasquatch Odyssey: The Hunt for Bigfoot, Gordon Strasenburgh is shown briefly speaking of his thoughts that Bigfoot is a human relative. 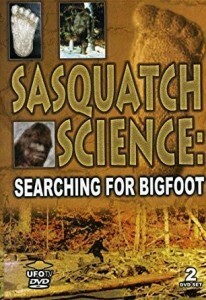 In 2004, a VHS (later in 2006, as a DVD) entitled Sasquatch Science: Searching for Bigfoot was released. It had long interviews with D. Jeff Meldrum and John Bindernagel, and short comments by Gordon Strasenburgh. Gordon R. Strasenburgh was extremely private. Here’s what we do know of his publicly shared life. We only know a little about the man who would be interested in Bigfoot. 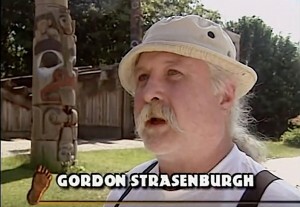 Gordon’s son, Gordon R. Strasenburgh Jr. was born in 1940. Gordon Randall Strasenburgh Jr. married Suzanne Ramer Bagley in 1966, in Alachua County (probably Gainesville, home of the University of Florida), Florida. Their marriage apparently was registered in Arlington, Virginia. 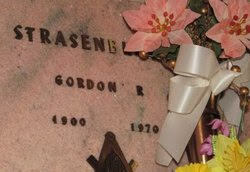 At the time of his death, Gordon Jr. had found his way to the Pacific Northwest, and was living in North Bend, Oregon, where he passed away. One of the bright lights of Bigfoot studies has left a gap among the naked apes. But his thoughtful theories, which are gaining new followers, live on. You were here for too short a time, and hopefully some unpublished works of yours will be discovered someday.